rip Josie - Poodle Forum - Standard Poodle, Toy Poodle, Miniature Poodle Forum ALL Poodle owners too! It was time. All the signs were there. A couple of you may remember when I took in Josie because my parents were finally, after much persuasion, going to an assisted living apartment due to many health issues. 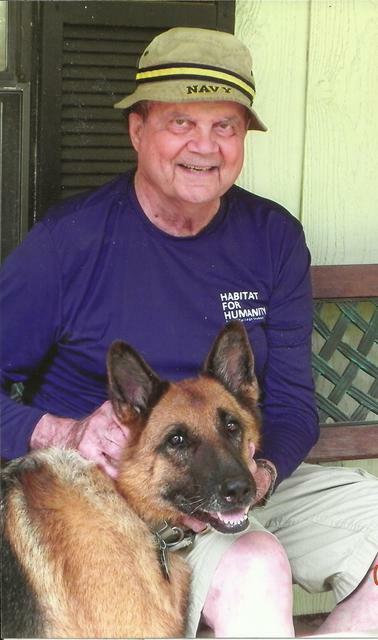 Josie was my dad's constant companion as he struggled to take care of my disabled mom. 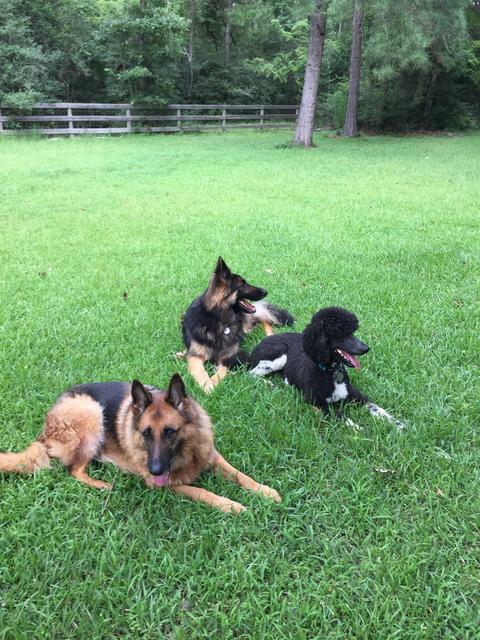 My mom could bring her beloved cats to assisted living but Josie, a 90lb German shepherd was not allowed. I was concerned at the time if she would fit in with my 3 dogs but was committed to keeping her separated if necessary. I followed the recommendation of PF members of meeting at a neutral area. We then walked home with all 4 dogs. It turned out that everyone was fine and I was greatly relieved. Josie had always been my dad's shadow and I thought for sure she would be my husband's. However, for some reason she bonded with me ( probably because I'm the keeper of the food and she was very food motivated ) and never let me out of her sight when I was home. I would bring her back many times to visit my dad over the next year, and he was always so appreciative and happy to see her. She was able to visit him up until a couple of weeks before he passed away almost 2 years ago. My dad got Josie when she was almost two from a friend who was mainly a budgie (parakeet) breeder and who traveled the world judging them. I remember she was not well -mannered and he took her to several training classes. One of his favorite stories, that my mom did not hear about until years later, was the time she grabbed a roast that had thawing on the kitchen cabinet and ran through the house with it. My dad wrestled that meat from her and promptly called his best friend who was a veterinarian. My dad asked if the meat would still be ok for human consumption. The vet said sure, just cook it well, and don't tell your wife! When my dad retired from director of a state agency, one of his favorite things was to volunteer with Habit for Humanity. He formed what became known as the "Chainsaw Gang" that consisted of retired university professors, veterinarians, and doctors that were his friends. Having been a forester his whole life he loved helping people with trees. This group helped take down dead or dying trees for Habitat and for people in their church. My entire childhood revolved around planting trees, watering trees, removing dead trees from friend's yards. My dad always had trees, watering buckets and manure for fertilizer in the back of his pickup truck. Sometimes as teenagers, my siblings and I found it embarrassing to be dropped off at a party or friend's house with a truckload of manure in the back! Anyway, Josie loved going with my dad to his Habitat projects and everyone loved having her there. Every picture I see of the Chainsaw Gang has Josie in it. Josie had turned 13 years old recently and had slowed down considerably for the past year. When it was time, my husband and I agreed we wanted an in-home euthanasia, so the vet came to our house. She was able to "go to sleep" in her bed with us petting her and holding her paws. She lived a wonderful, long life and we are glad to have had the last 3 years with her as part of the family. It was hard as she was such a last connection to my dad but I know he would have agreed the time was right. I am so sorry, what a lovely girl. I am sorry for your loss. Josie was a beautiful girl and she had a wonderful life. Thank you for letting her go peacefully and being with her at that time. You had a great Dad and he had a great dog. I am so sorry for this double loss. Hugs and hugs. I’m so sorry for your loss. It’s interesting how our pets get associationed with special memories so when we lose them we’re reminded of all those wonderful things such as Josie’s love of your dad. I know this is hard and sad for you, but I was so happy reading about the great life Josie had with your dad and then with you. I am sure the happy memories as you shared them with us will be great comfort for you. 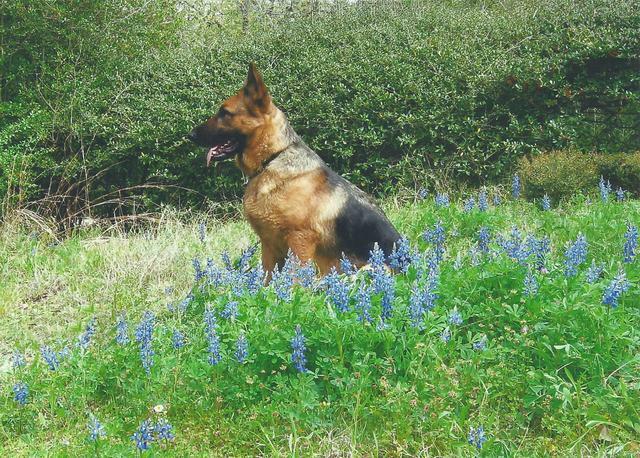 And wow 13 years old, she had a lovely long life for a GSD. 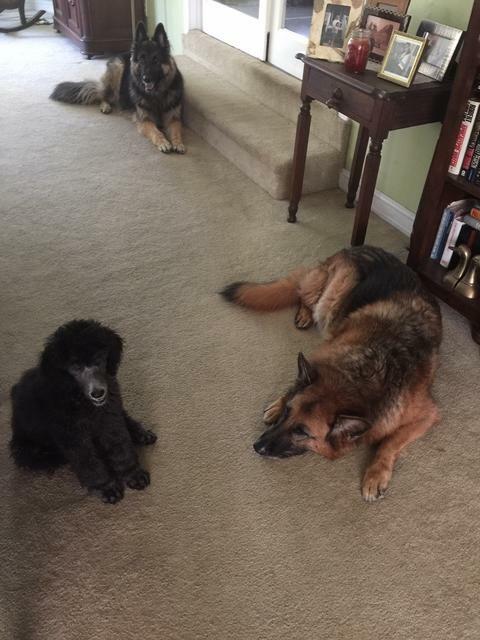 Our GSD Peeves is 10 and although he is mostly in good shape he definitely is a biologically older dog than 10 year old Lily. What a moving tribute to Josie and your Dad. I am glad the sleep was peaceful and filled with love. Oh Stormee, I'm so sorry :'( Josie was such a blessed dog to have your dad and then you take care of her. Sending you big hugs and lots of love!